Spear goblins card | Clash Royale fan-site! 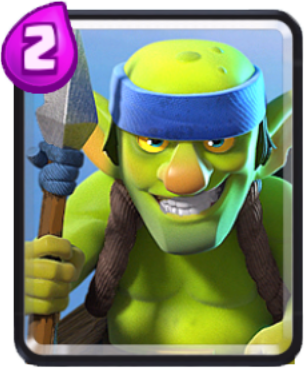 Like all other common cards in Clash Royale, Spear Goblins has 13 levels. Each upgrade increases its health and damage power. Due to low hitpoints the spear goblins are practically not suitable for use them alone (as in defense so in attack) as they will be eliminated quickly. Nevertheless, they can be very useful both in defense and in attack if to use them in pair with other character that has more health (or in pair with Tower, if to talk about defense). – Against ground-moving and single-targeting characters such as Prince, Knight, P.E.K.K.A , Golem, etc. For example, three goblins are able to hold a Mini P.E.K.K.A for at least 5 seconds due to its low attacking speed. – Against flying characters who are buildings oriented such as Lava Hound, Balloon, etc. (the exception is Inferno Dragon because Spear goblins are effective against it). Spear Goblins is useless if to use them alone against units that are able to attack group targets (Witch, Wizard, Dark Knight, etc.). For example, if to throw them into arena with the aim to stop Wizard – they would be destroyed before enter the battle. – very low damage power. 1. If Prince or Dark Knight is rushing to your Tower, pose the goblins aside his way. Such action would force enemy to change his target, turn and move toward the goblins. In many cases, such trick helps to save Tower from unnecessary damage. 2. If your Tower is under attack, you can place goblins a little bit aside from the tower. In such position, they will be able to attack enemy being under cover of a tower. 3. If enemy tower’s remaining health are low, you can send Spear Goblins to destroy it. In mostly cases, they can do it easy due to their high speed of movement and attack. This card has the lowest damage power among the all Clash Royale cards (only 56 per second on the max 13 lvl).